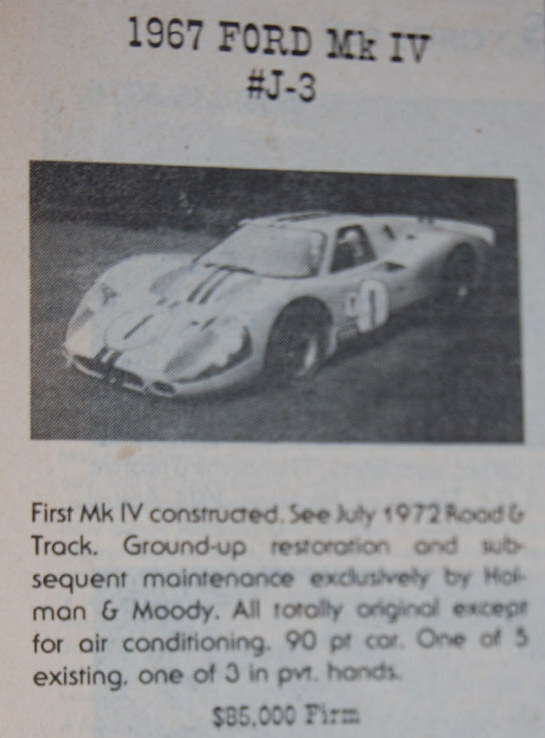 The latest look back at old classified advertisements features a 1967 Ford GT40 Mk IV offered for sale in the November 1976 issue of Hemmings for $85,000. The Ford GT40 was built to win long-distance sports car races, ultimately winning the 24 Hours of Le Mans four times in a row, from 1966 to 1969. The car was named the GT (for Grand Tourisme) with the 40 representing its overall height of 40 inches (measured at the windshield) as required by the rules. While the GT40 Mk II was successful, Ford decided to develop a car with better aerodynamics and lighter weight, plus to bring car more “in-house” and lessen its reliance on outside firms. Therefore, Ford Advanced Vehicles was sold to John Wyer and a new car was designed by Ford’s studios and produced by Ford’s subsidiary Kar Kraft under Ed Hull. The car would make full use of the new and more liberal Appendix J regulations for race car construction, and was therefore known as the J-car. The first J-car was completed in March 1966 and it set the fastest time at the Le Mans trials that year. The tub weighed only 86 lbs, and the entire car weighed only 2,660 lbs, 300 lbs less than the Mk II. However, due to its proven reliability, Ford (successfully) chose to run the Mk II at Le Mans in 1966. Following Le Mans, the development program for the J-car resumed, and a second car was built. During a test session at Riverside International Raceway in August 1966, with Ken Miles driving, the car suddenly went out of control at the end of Riverside’s very long back straight. The honeycomb chassis did not live up to its design goal, shattering upon impact, bursting into flames and killing Miles. It was decided that the unique, flat-topped “bread van” aerodynamics of the car, lacking any sort of spoiler, were implicated in generating excess lift, and a more conventional but significantly more aerodynamic body was designed for the Mk IV. Developed from the J-Car, the Ford GT40 Mk IV was build around a reinforced J chassis powered by the same 7.0 Litre engine as the Mk II. Excluding the engine, the Mk IV was totally different from other GT40s, using a specific chassis and specific bodywork. Although the Mk IV only raced twice, it won both races, the 1967 12 Hours of Sebring and the 1967 24 Hours of Le Mans. A GT40 Mk IV at the center of Ford’s fight against Ferrari would be well received in the marketplace. Although it does not have competition history, it oozes with history nonetheless and it is extremely rare. Given that a street version GT40 Mk I sold for $1,465,000 at RM Auctions’ Monterey event in August 2008, we would be surprised if J-3 is not valued in excess of $2,000,000 today. If you bought the Ford GT40 Mk IV for $85,000 in 1976, then your investment would have returned at least 10% over 33 years. Thanks for the history. I was young when Ford took on Le Mans and later learned of the J car and Ken’s death, but I never could quite find more about the J and how it fit into the Ford GT series. You could’ve bought 2 Ferrari GTOs for that price at the time. That was a fantastically huge amount of money then. I have seen photos of 2 GTOs sitting outside a dealership in Westchester N.Y in the early 70s covered in snow ! and my old boss Ed Jurist at the Vintage Car Store in Nyack N.Y sold over 200 Ferraris in his 30 years and had files on everyone ! Did you work at the vintage car store. I worked up in the balcony till around 1974……..maybe we know eachother. Hello , Yes , worked at the V.C.S in the late eighties till it closed when Ed past away , my desk was up the stairs on the left , were you there when Victor worked on the cars down stairs ? , I live in England now , I was back in Nyack a few months ago the place is still there now an Italian Restaurant , do you live in the area ? I used to visit with Victor (whatever happened to Victor? And what country was he from?) I think Victor opened his shop downstairs around 1973 or so? Anyway, before he became such a famous mechanic he worked on my Austin Healey 3000, a 1959, the first year out that I purchased from a Mr. Taylor who owned a flower shop in Nyack. He charged me a mere $125 ( I only paid $400 for the car with 29k miles, original Dunlaps still on it!) and tuned it up, fixed the brakes and the car ran great for years. I don’t remember Ed, just Victor. Not long after that work on my car I was down there asking him a question when a guy from the city came in and picked up his Rolls. Victor got the work done on that one early and the guy rolled up a $100 bill and put it in Victor’s hand as he shook it to thank him. I think I remember Victor driving a Rolls later himself.